Social media recruitment: What can you learn from an agency with real Klout? If you want to be seen as a serious recruiter in 2017, then you need to be doing social media - and doing it right. Our Social Recruiter 100 leaderboard gives an accurate benchmark as to how well different recruiters are doing when it comes to social media, and we caught up with our reigning champions to get their advice on how recruiters can do social better in 2017. Our Social Recruiter leaderboards use a points system called Klout to measure the impact your social media is having - and they are free to join whether you represent an external recruiter or in-house HR department. If you use social media in any capacity, then you can easily find out your Klout score - so it's a useful way to measure how your influence is progressing. Our boards give you a simple and free way of seeing how that relates to your competitors' activity within the recruitment industry. In order to see what it takes to become a social influencer in the recruitment industry, we'd like to introduce you to our 2016 Social Recruiter 100 champions, Ashley Kate HR. 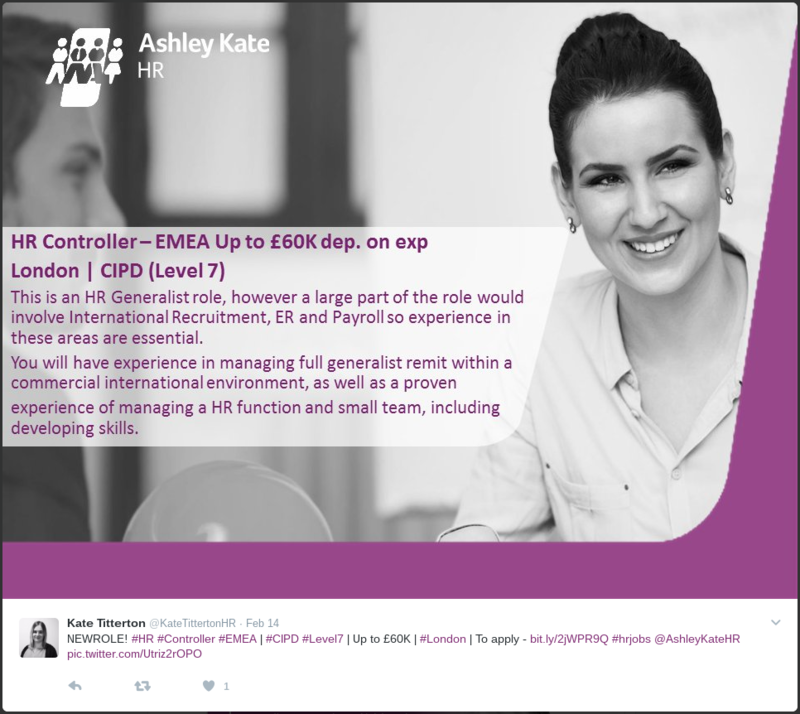 Clearly, Ashley Kate HR are a recruitment agency who are very active on social media, but what exactly is it they do that makes them so successful? Ashley Kate HR have been using social media properly since 2011 - making them relative pioneers as far as the recruitment sector is concerned - and the firm has fully committed to creating a high quality social media experience for their target audience. This is exemplified by the firm's HR Professionals Group on LinkedIn, which currently has over 15,000 members. Underlining this commitment to quality, each and every one of Ashley Kate HR's consultants has a branded LinkedIn and Twitter account, and consultants are given support and training by specialists to ensure that they are making effective use of social media. While, as recruiters, LinkedIn is Ashley Kate HR's natural habitat, you'll notice that they produce a diversified portfolio of social media content. In this vein, Ashley Kate HR note that "our largest audience is on LinkedIn as this is a natural place for the recruitment marketplace, however Twitter and Facebook allow us to get our message and culture across too". The lesson here is not to rely too heavily on any one form of social media. While the staid and corporate atmosphere of LinkedIn is a natural hunting ground for recruiters, that doesn't mean that the more social forms of social media are useless. If there's one piece of advice that crops up time and time again when speaking to social media power users, it's to know what your goals are so you can plan towards them. 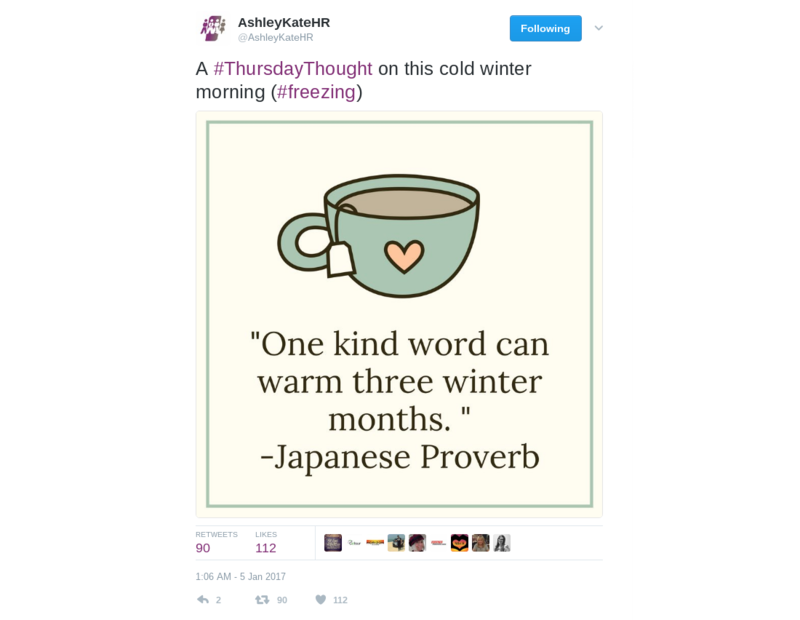 Accordingly, Ashley Kate HR rate "a creative mindset and the ability to think strategically" as two of the most important skills in good social media management. Precisely where you set your targets will depend on the specifics of your position in the market, but it's safe to say that using social media in a deliberate and strategic manner is a universally more productive method than a scattergun approach. Perhaps Instagram recruiting is a good idea if you work in the graphic design industry, but it might not be so hot if your game is accountancy. Likewise, Snapchat could be an effective way to engage with certain (read, younger) demographics, but not with others. If the people you're looking for don't tend to hang out on LinkedIn, then you need to think creatively. Ashley Kate HR use Hootsuite and the Chrome Extension Hootlet to do this, but there are many choices in this area - including Sprout Social and Tweetdeck. The main thing these tools allow you to do is schedule the release of your social media content. This means you can determine the optimum time for posts and get them to appear even if you are in a meeting. Ashley Kate HR point out that "a content calendar is essential to ensure that your accounts are updated with relevant information and news stories. Social media platforms should not just be used as a jobs feed, as adding value to your audience will reap better rewards". 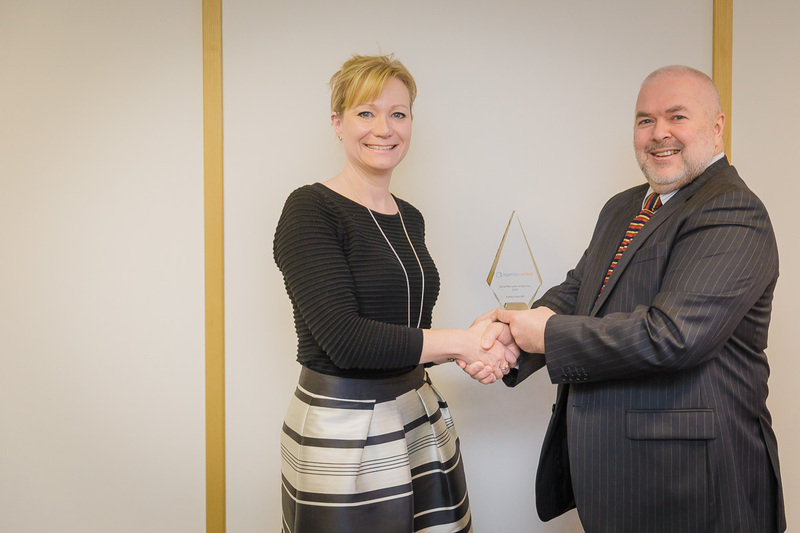 Karen Brown, Head of Operations for Ashley Kate HR, receives the Social Recruiter trophy from our Director, Kevin Drinkwater. Clearly not every type of social content lends itself to being scheduled ahead - with breaking news stories and reaction being the most obvious - but the ability to post content during primetime is absolutely golden. In order to make the most of this, think about events that are occurring for your target audience at any given time, and try to post accordingly. Once you gain this ability, research becomes paramount. Ashley Kate HR underlined the importance of looking into the things that have worked for you on social media (as well as the things that haven't) and analysing why this might have happened. As they put it, "developing a strategy which includes clear objectives for growth, reach, and engagement" is key. Look not only at things like when you posted a piece of content, but also at the type of content it is, and who interacted with it. This will help you to better target your output towards your audience. As Ashley Kate HR put it, "analytical skills are essential. Reviewing what works, when it works, which platform it works best on, where your audience is and the demographics of the people interacting with your platforms, will arm you with the knowledge to provide the best content". Some of the tools mentioned here are also useful for monitoring your brand - allowing you to see when your name has been mentioned even if you have not been tagged. This ability can pay real dividends in terms of reputation management - allowing you to safeguard your good name right across the social spectrum. One thing that Ashley Kate HR pointed out to us was that simply posting jobs on social media will never be enough for a recruiter to gather a loyal following. Instead, it is imperative that you interact with your audience - adding value and giving them a reason to keep following your content. Audience interaction is the key to effective social media use. Make them smile. The lesson to learn here is that not everything needs to be directly business related in order to do good business. People don't hang out on social media because they want to read buzzwords. You'll also notice that Ashley Kate HR maintain a strong YouTube presence - which broadens their social repertoire by allowing them to provide expert advice and news in a video format. While video production can be labour-intensive, it's a great way of giving your brand a more human face. Social media is a great way to strengthen your brand. Branded social job ads are a great place to start. While no one seriously has a social media crystal ball, it is possible to do some analysis and take a pretty good guess what's coming up - and we asked Ashley Kate what they thought would be important this year. Ashley Kate HR plans to make a big push into some of the more alternative forms of social media in 2017. They said: "We are developing plans to launch our Snapchat account in early 2017 and a strategy for updating and utilising our YouTube channel. [We] think the future is not about 'read' or 'subscribe' to our newsletter, [we] think our audience would much prefer to watch a company video". Snapchat is already being used to great effect by a number of companies for recruitment purposes - and at the risk of dropping a cliche, it's millennials they're targeting with it. If that sounds like something that could benefit your recruitment operation, then 2017 is a great time to step into it. Just be sure you know what you're doing, and make that content captivating. If you're looking to position yourself as a social influencer in your field (and you should be), then YouTube is a great place to foster that. Nothing says expertise like a YouTube channel that regularly produces quality informative content. On one hand this is a fairly large investment in terms of time and resources, but on the other, your viewers will know that. Brand it well, don't cut any corners, and give staff involved the room they need to do things properly, and YouTube could be great source of influence for your recruitment agency. Video in general is making waves on social media right now - and often it's of the live variety. While live video might not be especially useful to a recruiter, it does give you some idea of where social is heading in general. That's more up-to-the-minute content, more interaction with your audience, more of an investment, and (hopefully) more of a return. If you're just starting out in social, we really cannot overstate how important it is to know your audience. And don't just assume that you know them either. Talk to them. Run polls and surveys. Find out what they think, and work out what it is that they want. Then give them what they're looking for. All of the information above is great, but sort of useless to you if you can't apply it to your business and act on it. The good news is that there isn't a single recruitment agency that wouldn't benefit from making proper use of social media. The key to good social media use to know where you want to be with it all. Get a goal. Once you've got a goal, you can then look at where you are right now and literally just join the dots. That then gives you a plan. It's true that there are companies (and indeed recruiters) out there who have a terribly ineffective approach to social media, and your plan will stop you ending up on this list. Fail to prepare, prepare to fail, as they say. If you're struggling to know the first step to take, or simply don't have the time, why not speak to us for some advice? We're incredibly social people and we love to help recruitment businesses achieve their goals. For more information, check out our recent article looking at how social media is affecting the recruitment industry in general.